The pulmonary circulation is the portion of the circulatory system which carries deoxygenated blood away from the right ventricle of the heart, to the lungs, and returns oxygenated blood to the left atrium and ventricle of the heart. The term pulmonary circulation is readily paired and contrasted with the systemic circulation. The vessels of the pulmonary circulation are the pulmonary arteries and the pulmonary veins. A separate system known as the bronchial circulation supplies oxygenated blood to the tissue of the larger airways of the lung. The earliest human discussions of pulmonary circulation date back to Egyptian times. Human knowledge of pulmonary circulation grew gradually over centuries, and scientists Ibn al-Nafis, Michael Servetus, and William Harvey provided some of the first accurate descriptions of this process. 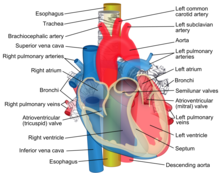 Deoxygenated blood leaves the heart, goes to the lungs, and then re-enters the heart; Deoxygenated blood leaves through the right ventricle through the pulmonary artery. From the right atrium, the blood is pumped through the tricuspid valve (or right atrioventricular valve), into the right ventricle. Blood is then pumped from the right ventricle through the pulmonary valve and into the main pulmonary artery. The pulmonary arteries carry deoxygenated blood to the lungs, where carbon dioxide is released and oxygen is picked up during respiration. Arteries are further divided into very fine capillaries which are extremely thin-walled. The pulmonary vein returns oxygenated blood to the left atrium of the heart. The oxygenated blood then leaves the lungs through pulmonary veins, which return it to the left heart, completing the pulmonary cycle. This blood then enters the left atrium, which pumps it through the mitral valve into the left ventricle. From the left ventricle, the blood passes through the aortic valve to the aorta. The blood is then distributed to the body through the systemic circulation before returning again to the pulmonary circulation. From the right ventricle, blood is pumped through the semilunar pulmonary valve into the left and right main pulmonary arteries (one for each lung), which branch into smaller pulmonary arteries that spread throughout the lungs. A number of medical conditions can affect the pulmonary circulation. Pulmonary embolus is a blood clot, usually from a deep vein thrombosis that has lodged in the pulmonary vasculature. It can cause difficulty breathing or chest pain, is usually diagnosed through a CT pulmonary angiography or V/Q scan, and is often treated with anticoagulants such as heparin and warfarin. Cardiac shunt is an unnatural connection between parts of the heart that leads to blood flow that bypasses the lungs. The discovery of pulmonary circulation has been attributed to several scientists over the years. In much of modern medical literature, the discovery is credited to English physician William Harvey (1578 - 1657 CE). Other sources credit Spanish physician Michael Servetus (c. 1509 - 1553 CE) and Arab physician Ibn al-Nafis (1213 - 1288 CE) with the discovery. However, the first descriptions of the cardiovascular system came before these men. The earliest known description of the role of air in circulation was produced in Egypt in 3500 BCE. At this time, Egyptians believed that the heart was the origin of many channels that connected different parts of the body and transported air as well as urine, blood, and the soul. The Edwin Smith Papyrus (1700 BCE), named for American Egyptologist Edwin Smith (1822 - 1906 CE) who purchased the scroll in 1862, provided evidence that Egyptians believed that the heartbeat created a pulse that transported the above substances throughout the body. A second scroll, the Ebers Papyrus (c. 1550 BCE), also emphasized the importance of the heart and its connection to vessels throughout the body and described methods to detect cardiac disease through pulse abnormalities. However, despite their knowledge of the heartbeat, vessels, and pulse, the Egyptians attributed the movement of substances throughout the vessels to air that resided in these channels, rather than to the heart's force. The Egyptians knew that air played an important role in circulation, but they did not yet have a concept for the precise role of the lungs. The next addition to the human understanding of pulmonary circulation came with the Ancient Greeks. The physician Alcmaeon (520 - 450 BCE) proposed that the brain, not the heart, was the connection point for all of the vessels in the body. He believed that the function of these vessels was to bring the spirit (pneuma) and air to the brain. Empedocles (492 - 432 BCE), a philosopher, proposed a series of pipes impermeable to blood but continuous with blood vessels which carried the pneuma throughout the body. He proposed that this spirit was internalized with pulmonary respiration. The physician Hippocrates (460 - 370 BCE) developed the view that the liver and spleen produced blood, which traveled to the heart to be cooled by the lungs that surrounded it. Hippocrates described the heart as having two ventricles connected by an interventricular septum. He depicted the heart as the connecting point for all the vessels of the body and proposed that some vessels carried only blood, while others also carried air. These air-carrying vessels were the pulmonary veins, which brought air to the left ventricle, and the pulmonary artery, which carried air to the right ventricle and blood to the lungs. He also proposed two atria of the heart that functioned to capture air. Hippocrates was one of the first to begin to accurately describe the anatomy of the heart and to describe the involvement of the lungs in circulation, but his descriptions of the process of pulmonary circulation and of the functions of the parts of the heart were still largely incorrect. Greek philosopher and scientist Aristotle (384 - 322 BCE) followed Hippocrates and proposed that the heart had three ventricles, rather than two, that all connected to the lungs. The Greek physician Erasistratus (315 - 240 BCE) agreed with Hippocrates and Aristotle that the heart was the origin of all of the vessels in the body but proposed a system in which air was breathed into the lungs and traveled to the left ventricle via pulmonary veins. It was transformed there into the pneuma and distributed throughout the body by arteries, which contained only air. In this system, veins distributed blood throughout the body, and this blood did not circulate, but rather was consumed by the organs. The Greek physician Galen (129 - c. 210 CE) provided the next insights into pulmonary circulation. Though many of his theories, like those of his predecessors, were incorrect, his theory of pulmonary circulation dominated the medical community for hundreds of years after his death. Galen contradicted Erasistratus before him by proposing that arteries carried both air and blood, rather than air alone. He proposed that the liver was the point of origin for all blood vessels and that the heart was not a pumping muscle, but rather an organ which blood passed through. Galen's theory included a new description of pulmonary circulation. In it, air was inhaled into the lungs where it became the pneuma. Pulmonary veins transmitted this pneuma to the left ventricle of the heart to cool the blood simultaneously arriving there. This mixture of pneuma, blood, and cooling produced the vital spirits which could then be transported throughout the body via arteries. Galen also proposed that the heat of the blood arriving in the heart produced noxious vapors which were expelled through the same pulmonary veins that first brought the pneuma. He wrote that the right ventricle played a different role than the left; it transported blood to the lungs where the impurities were vented out so that clean blood could be distributed throughout the body. Though Galen's description of the anatomy of the heart was more complete than those of his predecessors, it included several mistakes. Most notably, Galen believed that blood flowed between the two ventricles of the heart through small, invisible pores in the interventricular septum. The next developments in the human understanding of pulmonary circulation did not come until centuries later. Persian polymath Avicenna (c. 980 - 1037 CE) wrote a medical encyclopedia entitled The Canon of Medicine. In this book, he translated and compiled contemporary medical knowledge and added some new information of his own. However, Avicenna's description of pulmonary circulation reflected the incorrect views of Galen. The arab physician, Ibn al-Nafis, wrote the Commentary on Anatomy in Avicenna's Canon in 1242 in which he provided the first known accurate description of pulmonary circulation as it is known today. Ibn al-Nafis made two key improvements on Galen's ideas of pulmonary circulation. First, he disproved the existence of the pores in the interventricular septum that Galen had believed to allow blood flow between the left and right ventricles. Second, he followed that the only way for blood to get from the right to the left ventricle in the absence of interventricular pores was pulmonary circulation. He also described the anatomy of the lungs in clear, correct detail, which his predecessors had not. However, like Aristotle and Galen, al-Nafis still believed that the vital spirit was formed in the left ventricle from a mixture of blood and air. Despite the enormity of Ibn al-Nafis's improvements on the theories of pulmonary circulation that preceded him, his commentary on The Canon was not widely known to Western scholars until the manuscript was discovered in Berlin, Germany, in 1924. As a result, Ibn al-Nafis was not widely credited with the discovery of pulmonary circulation in Western medical literature until recently. It took several hundred years for European scientists and physicians to reach the same conclusions that al-Nafis had. Italian polymath Leonardo da Vinci (1452 - 1519 CE) was one of the first to propose that the heart was just a muscle, rather than a vessel of spirits and air, but he ascribed to Galen's ideas of circulation and defended the existence of interventricular pores. The Flemish physician Andreas Vesalius (1514 - 1564 CE) published corrections to Galen's view of circulatory anatomy, questioning the existence of interventricular pores, in his book De humani corporis fabrica libri septem in 1543. Michael Servetus after him was the first European physician to accurately describe pulmonary circulation. His assertions matched those of al-Nafis, and though he has been frequently credited with making the discovery on his own, it is likely that he had access to Ibn al-Nafis's work while writing his own texts. Servetus published his findings in Christianismi Restituto (1553), a theological work that was considred "heretical" by Catholics and Calvinists alike, burned on the stake (along with its author) and barely survived in a few copies. Italian physician Realdo Colombo (c. 1515 - 1559 CE) published a book, De re anatomica libri XV, in 1559 that accurately described pulmonary circulation as well. It is still debated among historians as to whether or not Colombo reached his conclusions on his own or if he based his work on those of al-Nafis and Servetus. Finally, William Harvey provided the most complete and accurate description of pulmonary circulation of any of the European physicians in his treatise Exercitatio Anatomica de Motu Cordis et Sanguinis in Animalibus in 1628. ^ Hine R (2008). A dictionary of biology (6th ed.). Oxford: Oxford University Press. p. 540. ISBN 978-0-19-920462-5. ^ a b c d e f g h Akmal M, Zulkifle M, Ansari A (March 2010). "Ibn nafis - a forgotten genius in the discovery of pulmonary blood circulation". Heart Views. 11 (1): 26–30. PMC 2964710. PMID 21042463. ^ Ribatti D (September 2009). "William Harvey and the discovery of the circulation of the blood". Journal of Angiogenesis Research. 1: 3. doi:10.1186/2040-2384-1-3. PMC 2776239. PMID 19946411. ^ Azizi MH, Nayernouri T, Azizi F (May 2008). "A brief history of the discovery of the circulation of blood in the human body" (PDF). Archives of Iranian Medicine. 11 (3): 345–50. PMID 18426332. ^ a b Bosmia A, Watanabe K, Shoja MM, Loukas M, Tubbs RS (July 2013). "Michael Servetus (1511-1553): physician and heretic who described the pulmonary circulation". International Journal of Cardiology. 167 (2): 318–21. doi:10.1016/j.ijcard.2012.06.046. PMID 22748500. ^ a b c d e f g h i Bestetti RB, Restini CB, Couto LB (December 2014). "Development of anatomophysiologic knowledge regarding the cardiovascular system: from Egyptians to Harvey". Arquivos Brasileiros de Cardiologia. 103 (6): 538–45. doi:10.5935/abc.20140148. PMC 4290745. PMID 25590934. ^ a b c d ElMaghawry M, Zanatta A, Zampieri F (2014). "The discovery of pulmonary circulation: From Imhotep to William Harvey". Global Cardiology Science & Practice. 2014 (2): 103–16. doi:10.5339/gcsp.2014.31. PMC 4220440. PMID 25405183. ^ Nunn JF (1996). Ancient Egyptian Medicine. London: British Museum Press. ISBN 978-0714109817. ^ Loukas M, Tubbs RS, Louis RG, Pinyard J, Vaid S, Curry B (August 2007). "The cardiovascular system in the pre-Hippocratic era". International Journal of Cardiology. 120 (2): 145–9. doi:10.1016/j.ijcard.2006.11.122. PMID 17316844. ^ a b Aird WC (July 2011). "Discovery of the cardiovascular system: from Galen to William Harvey". Journal of Thrombosis and Haemostasis. 9 Suppl 1 (Suppl. 1): 118–29. doi:10.1111/j.1538-7836.2011.04312.x. PMID 21781247. ^ a b c West JB (December 2008). "Ibn al-Nafis, the pulmonary circulation, and the Islamic Golden Age". Journal of Applied Physiology. 105 (6): 1877–80. doi:10.1152/japplphysiol.91171.2008. PMC 2612469. PMID 18845773.